We recommend: Site of Portovenere, a very beautiful city near Cinque Terre! First of all, the most convenient type to arrive to the Cinque Terre is by train. However, you can also reach La Spezia (Levanto or other nearby cities) with any other preferred way and then take the train. 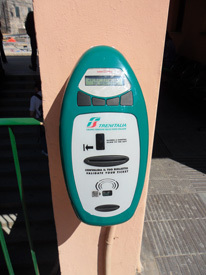 Information centres can be found at all railway stations of La Spezia and villages of Cinque Terre. As the main reference point is usually taken the train station of La Spezia. You can take a regional train that stops in every village of the Cinque Terre (every 20-30 min) or go for a walk through the city of La Spezia to the dock to take the motor ship. Some trains from La Spezia doesn`t stop in all towns, going regularly only in Monterosso, because it is a big resort town. We suggest you to buy the Cinque Terre CARD (day pass or more days) if you want to travel with comfort the full day between the Cinque Terre. 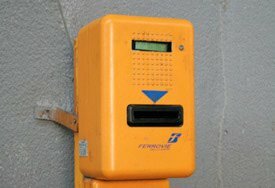 The Card expires at midnight and don`t forget to stamp it at one of the yellow machine (in 2012 all machines were upgraded, now they are blue) in the train station before your departure. 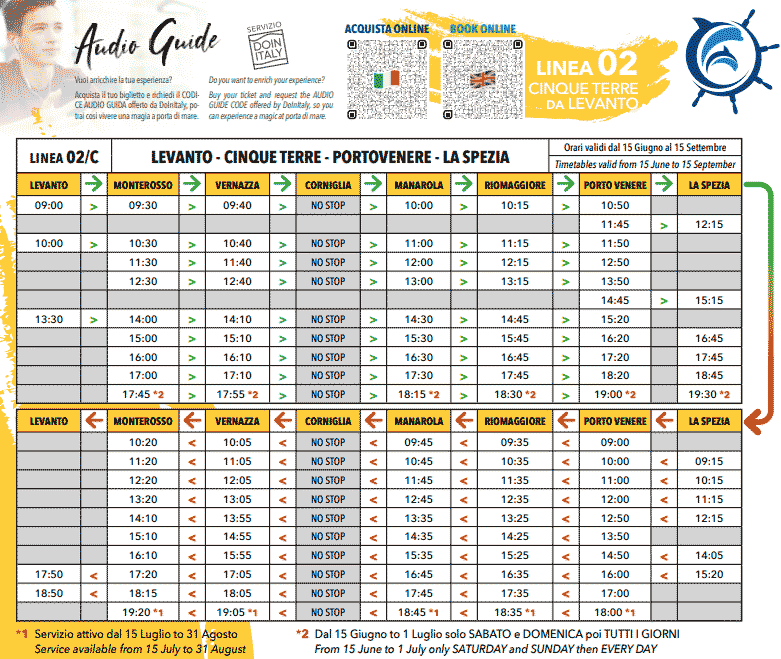 You can consult website Trenitalia to know Cinque Terre train schedule and ticket prices or you can take the list in the tourist centres, which are located in all railway stations of the Cinque Terre. Personally, I use my smartphone application named "Trenitalia", it is very easy. Advice: for ease of movement in Cinque Terre you can buy a Cinque Terre CARD that cost 16 euro (2019). It includes trains between Levanto and La Spezia (all of Cinque Terre) for the whole day, walking trails of the Blue Path and much more. Even in the case of a transport strike 90% of trains are on the line are running. We should warn you that taking a car is not the best plan to visit the Cinque Terre. First, roads are winding and twisted and often go downhill and then can go steep uphill. Also, there are only a few areas for parking, because centres of the towns are closed to private traffic. These reasons should discourage you from using the car, taking into account that its lots simpler to visit this area by train, hiking or boat. 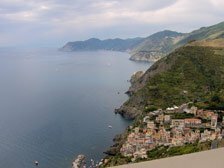 But if nevertheless you want to travel by a car, you always can rent a car (tip: to rent a car in Cinque Terre go to the site of Hertz, Sixt, Avis - check for best price). You can travel to the Cinque Terre by car from La Spezia by the State Route Nr. 370 "Litoranea delle Cinque Terre". The main highway exit is "LA SPEZIA - SANTO STEFANO DI MAGRA" on the motorway A12 Genova - Livorno or A15 Parma - La Spezia. From the gate, keep on for La Spezia and when you arrive in the city keep on along the seaside looking the signs for Portovenere - CINQUE TERRE. At some point these two routes divide: you can proceed up the hill in direction to Riomaggiore - Manarola (blue line on the map). For Monterosso (green line on the map) the nearest motorway exit is on the motorway A12 Genova - Livorno (named "Carrodano"). At the gate follow the signs for Levanto. When you're in Levanto then you can continue for the centre and turn right and then go in the direction of Monterosso on the left. You need to travel some kilometres uphill and then after the tunnel you will see the signs for Monterosso. Vernazza and Corniglia: (indicated with a red line) are the two most isolated towns in Cinque Terre. We would strongly recommend you do not come there by car. Note: THERE ARE NO PETROL STATIONS on the roads between the Cinque Terre villages. The second map shows the best parking spaces in La Spezia. Green is for the free-of-charge parking spots. The far right parking place on the map is the largest car park and it is served by the free-of-charge bus. For rent a car in Cinque Terre visit the site of Hertz, Sixt, Avis - check for best price. The nearest airports to La Spezia are: "C. Colombo" (international) in Genoa (112 km) and "G. Galilei" (international) in Pisa (84 km). But if you are looking low cost fly to Cinque Terre you can also check airports of Milano, Parma and Bologna. In airports you can rent a car or better yet, take a train. To find best price for flights use this site (Skyscanner) (nearest destinations: Pisa, Genova, Parma, Milano, Bologna). The paid parking intended specially for camper was made in Manarola (it is located on gravel, without an additional shadow, it has lighting, toilets and drinking water). Places are limited. Also, there is a big parking in Monterosso where you can leave your camper, but there are no additional services. The maritime consortium of "5 Terre, Gulf of the Poets" is happy to offer their boats and give the opportunity of tourist visits on their ships along the unforgettable Ligurian coastline. The consortium owns a fleet of about 15 boats of different sizes and capacity which transports tourists from the harbours of La Spezia, Portovenere and Lerici to the villages of the Cinque Terre. There are also links to other locations on the west coast: Levanto, Deiva Marina, Bonassola, Portofino and Moneglia. We also have links from La Spezia to the island of Palmaria. During the summer period there are departures from Marina di Massa, Marina di Carrara, Viareggio and Forte dei Marmi for the Portofino and Cinque Terre. Boat timetable is on the image on the left. 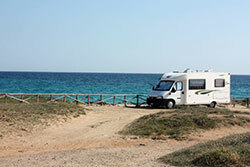 Prices range according to the route you choose, from 6 euro to 35 euro for unlimited one-day pass. More detailed information is available on the official website: Best of Cinque Terre. Valid: from April 1, 2019 till November 2, 2019.